Functional magnetic resonance imaging (fMRI) and other brain imaging technologies allow for the study of differences in brain activity in people diagnosed with schizophrenia. 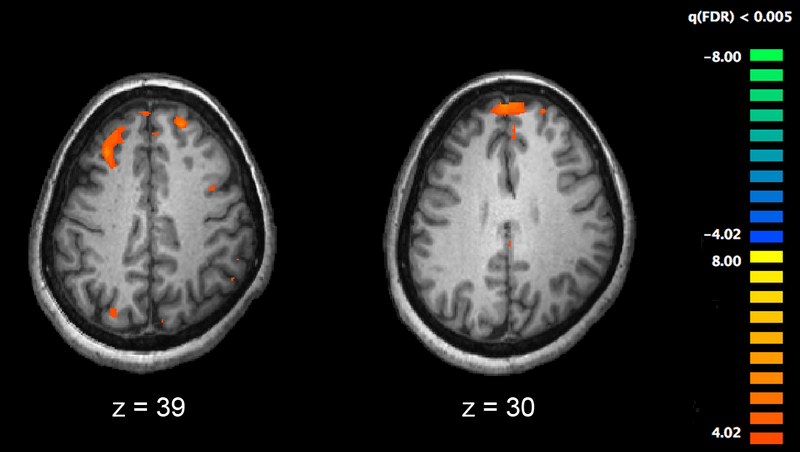 The image shows two levels of the brain, with areas that were more active in healthy controls than in schizophrenia patients shown in orange, during an fMRI study of working memory. Credit: Kim J, Matthews NL, Park S./PLoS One. Executive cognitive functions—abilities that include working memory and underlie mental control and self-regulation—are impaired in schizophrenia. Current pharmacological and behavioral interventions have only modest pro-cognitive effects. In studies of individuals with schizophrenia and healthy participants, Neil Woodward, PhD, and colleagues tested executive functions and used imaging (diffusion-weighted MRI) to quantify connections between brain regions that support executive functions. They report in the March 15 issue of Biological Psychiatry that connectivity between the prefrontal cortex and the thalamus is reduced in schizophrenia. The reduced connectivity correlated with impaired working memory but not with other executive functions (cognitive flexibility and inhibition). They also found increased connectivity between the thalamus and the somatosensory and occipital cortices in schizophrenia. The findings are consistent with other studies that implicate disrupted prefrontal cortex-thalamic function in the pathophysiology of schizophrenia, and they suggest that the connection between these brain regions may be an important target for pro-cognitive interventions.